Now in its 4th edition, ESL (ELL) Literacy Instruction combines a comprehensive scope with practical, research-based tools and applications for reading instruction. Designed for use by pre-service and in-service teachers, this guidebook provides the context and expertise to plan and implement reading programs that match the needs and abilities of students at all ages and levels of proficiency. The book explains different models of literacy instruction from systematic phonics to whole language instruction, discusses controversies in the field, and includes specific teaching methods within each model. The 4th edition highlights recent developments in education policy, new models of instruction, and devotes greater attention to issues surrounding assessment. An expanded companion website integrates with the text to offer additional tools and examples, and readers are encouraged to develop their own teaching strategies within their own instructional models. 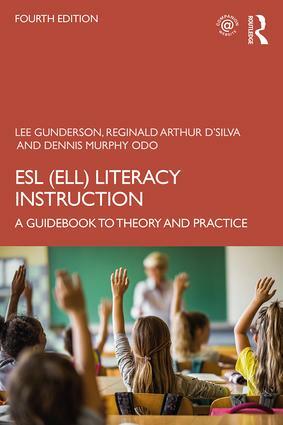 Providing a thorough overview of the history and major issues of ESL (ELL) literacy instruction, this book will be of great interest to pre-service and in-service teachers at all levels, from kindergarten to adult learners. Lee Gunderson is Professor of Language and Literacy Education at the University of British Columbia, Canada. Reginald Arthur D’Silva is a Senior Instructor and the Academic Director of the Ritsumeikan Academic Exchange programs at the University of British Columbia, Canada. Dennis Murphy Odo is Associate Professor of English Language Educationat Pusan National University, Republic of Korea.